Ethernet switch usually acts as a hub that connects network devices and segments together while having the intelligence to send data where it needs to go. There are both managed and unmanaged switches. Managed switch as the names implies, can be programmed, while unmanaged switch simple allows Ethernet devices to communicate with one another. Besides, most fiber optic switches have 5, 8, 10, 24 or 48 ports. This article will introduce 5 TP-Link 8-Ports Desktop switch, and its cabling solutions. 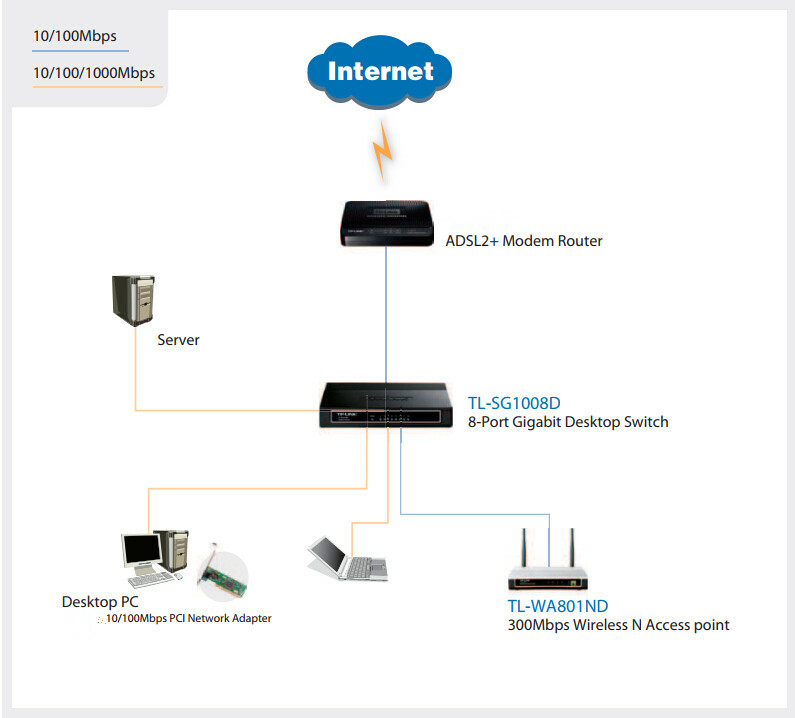 TL-SG1008D is the cost-effective TP-Link 8 port Desktop Gigabit Switch, which sells $24.99 . It has 8 Gigabit Auto-Negotiation RJ45 ports with switching capacity of 10Gbps. 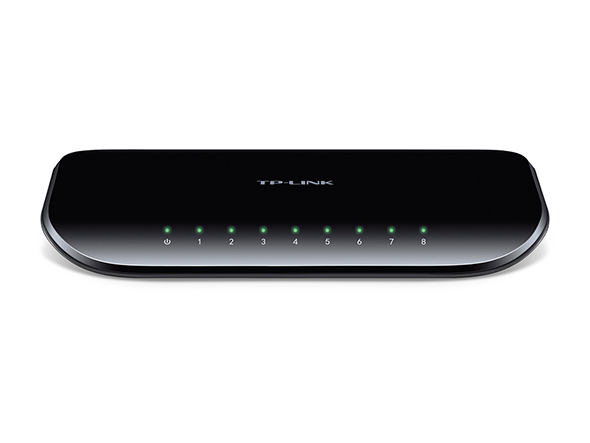 The TP-Link 8-Port desktop switch TL-SG1008D offer an easy path to make the transition to Gigabit Ethernet. Its auto-negotiation ports provide smart integration between 10Mbps, 100Mbps, and 1000Mbps hardware. With the innovative energy-efficient technology, the TL-SG1008D can save up to 75%/80% of the power consumption, making it an eco-friendly solution for your home or office network. Moreover, the auto features of TL-SG1008 unmanaged switch make installation plug and play and hassle-free. TL-SG1008 unmanaged switch has no need to configure. Once setting up in the office or home network, this optical switch will provide you with a high-performance, low-cost, easy-to-use, seamless and standard upgrade to 1000Mbps network. Simply plug and play, an ordinary person can install it. Moreover, auto MDI/MDIX eliminates the need for crossover cables. All 8 ports of desktop switch, featuring non-blocking switching architecture can provide large file transferring and downloading that are compatible with 10Mbps and 100Mbps Ethernet devices. Supports IEEE 802.3x ow control for Full Duplex mode and back pressure for Half Duplex mode. When a computer or network equipment is off, the corresponding port of a traditional switch will continue to consume considerable amounts of power. The TL-SG1008D can automatically detect the link status of each port and reduce the power consumption of ports that are idle, resulting in up to an 80% reduction in power use. Another great thing about this network switch is that it offers a fanless design, meaning that you won’t hear anything annoying while you are working. The TL-SG1008D Switch is equipped with 8 10/100/1000Mbps Auto-Sensing RJ45 ports that is aimed towards budget oriented people. For the price of TL-SG1008D, this low-priced fanless switch will take care of all your intermediate networking needs without a hiccup. Besides you can directly buy the cost-effective copper cables from FS.COM, which will surely save a large sum of money. This is the simple layout of your network. Choosing the right optical switch is not an easy thing, either the experienced network installer, nor the completely inexperienced one. This article lists the main features of TL-SG1008D fanless switches, which will make sure people don’t have any issue choosing the best network switch in the market. Another great thing that we did to make things easier for you is making sure that you have abundance of options to choose from, from the highest end ones to the budget friendly ones, everything is basically in order for everyone.